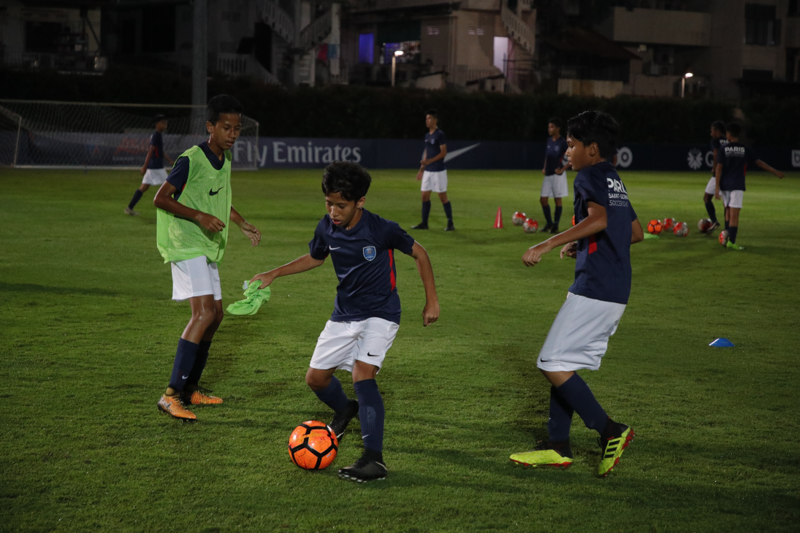 SINGAPORE, 27 JULY 2018: Twenty youth players from the Football Association of Singapore (FAS) Under-14 Selection Squad experienced the opportunity of a lifetime on Wednesday night, courtesy of French champions Paris Saint-Germain (PSG). The boys were invited to watch the Ligue 1 giants train at Geylang Field yesterday evening, before getting a glimpse of the PSG way first-hand at a coaching clinic thereafter. Even though Thomas Tuchel’s team arrived sans Neymar, Kylian Mbappe and Edinson Cavani, it was still a treat for the FAS U-14 players to witness the likes of Gianluigi Buffon, Julian Draxler and Marco Verratti at PSG’s first training session since arriving in Singapore for the International Champions Cup. Before their almost two-hour long training session, the PSG team took a group photo with the FAS players and their coaches, which delighted the boys. “It’s a rare opportunity to watch players we can usually see only on television,” said goalkeeper Sunny Tia, a Kranji Secondary School student. “It’s not like everyone in Singapore can come and get close up with them, so I feel really lucky. 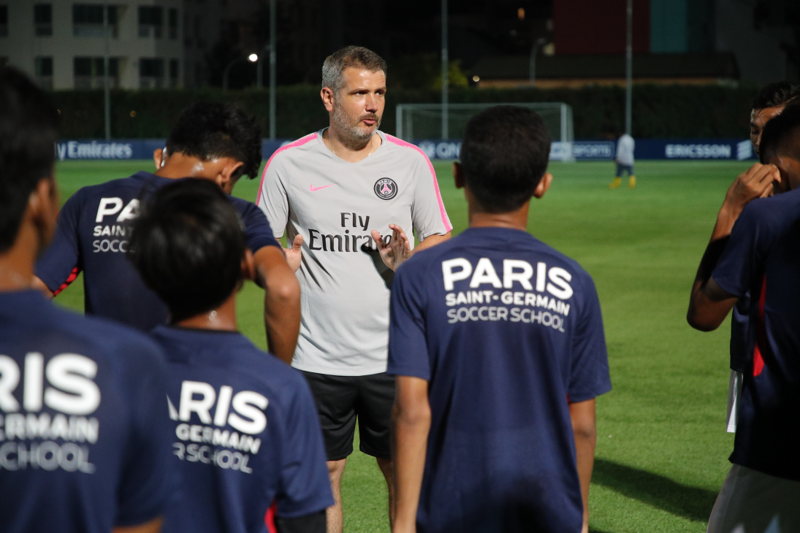 After the training, the FAS players then took to the field for a coaching clinic conducted by PSG Academy Technical Director, Pierre-Yves Bodineau. Bodineau was assisted in the set-up of the clinic by the four FAS coaches in attendance – Azman Mohd, Aidil Sulaiman, Kamadruzaman Zainal and Herwandy Hamid. Split into two groups of eight and ten, the players took turns to undergo two stations – one a dribbling, passing and shooting station, the other designed to train game perception and spatial awareness. The latter station was set up in a grid of four squares, with two teams of three taking on each other, aided by two jokers. Once the player with the ball passes it to a team-mate, he has to move to a different square. This encourages players to open up and be more aware of the space around them. “Initially the boys had problems because it required quite high-level thinking and movement but as it progressed, they got the idea of it,” Herwandy commented. “I found it very interesting because it instigates the boys to think. The PSG philosopy is that players should not be attracted to the ball, they should be looking for space and opening up; that’s what I learned. Bodineau noted that the players need to “develop the cognitive aspects and comprehension” of their game in order to play better, but was impressed with the attitude on display. He also singled out Nur Muhammad Asis Ijilrali as someone “to look out for” after the boy caught his eye during the nine-versus-nine small-sided game, played after all players had all gone through both stations. It was not just the players who benefited from Bodineau’s expertise. Herwandy pointed out that it was an eye-opening session for the coaches as well, even though it only lasted around 40 minutes. “Even when I watched the main team train, their speed of thought (was a different level),” he said. “The space is so small but they can still play out (of it)! He added that the players enjoyed themselves so much that they did not want the session to end, but Bodineau did have some words of wisdom for them. “To succeed as professional players, they need to work a lot, to listen and to understand faster than the others,” he emphasised.